All transactions are safe and secure with a reliable history in online purchasing behind each of our associates. 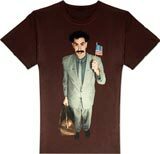 Buy the Borat Movie Poster t-shirt to own Borat clothing and merchandise. This brown tee features an image of Borat Sagdiyev as he is seen in the Borat movie poster artwork. These Borat t-shirts show the smiling Kazakhstan journalist holding an American flag in one hand and a duffle bag in the other. He is dressed in a suit, and he is ready to make a good first impression on another unsuspecting American. In addition to the Borat Movie Poster tee above, browse the Borat Clothing Gallery for more apparel like men's and women's clothes, kids shirts or hoodies.